Commercial organizations know the importance of presentation. Perception, as the saying goes, is reality. And the very first thing a visitor perceives when visiting your building is the lawn. 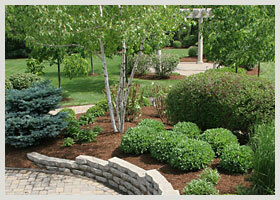 Clean Cut Lawn & Landscape specializes in landscape solutions that are in alignment with the character of our clients. Working with a licensed landscape architect, we determine what plants, materials, and other elements best reflect their brand. It’s not only about creating a great-looking space, but a truly distinctive one, too.